We are very proud of our biologically appropriate 80:20 range. It is formulated to satisfy the need of the most carnivorous of pets. They all contain 80% meat ingredients with more than 50% of the entire mix being freshly-prepared meat, few other products get even close to this sort of meat inclusion. 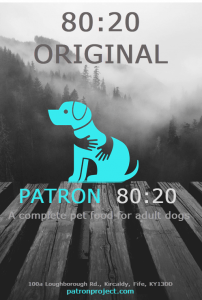 Our unique fresh-trusion process (which enables us to cook this mix at just 90oC) demands we use some potato ingredients to bind the kibble. 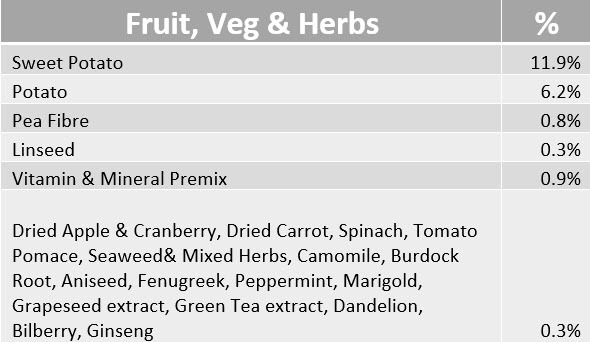 After that we add some vital fruit, veg and herb additions, especially chosen for their phytochemical benefits. We are rolling out with our Original formula first there are two more coming soon! 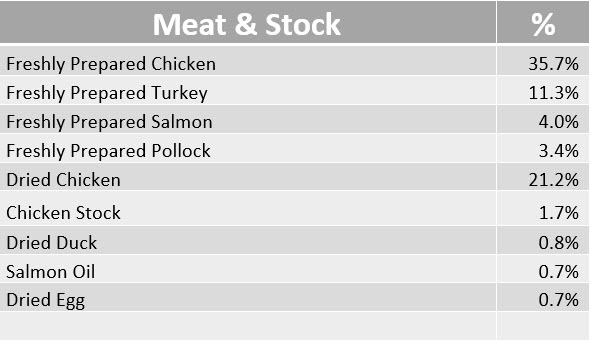 While not many dry foods like to list the exact inclusion rates of their ingredients, below is what we put in every 80:20 mix.